WAFFLES: Hey Boss, this Christmas tree looks a little funny. Where's all the bushy needles and dangly toys and stuff? KATIE: Apparently Glogirly still doesn't trust you with the real thing, so she's going with a sparse wintry theme this year. Way to go, Waffles. 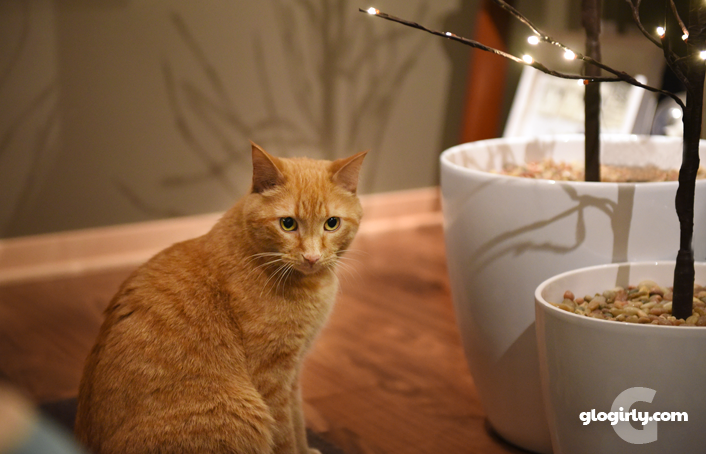 Your Chrisstmas tree and ornament indiscretions have resulted in BOTH of our losses. 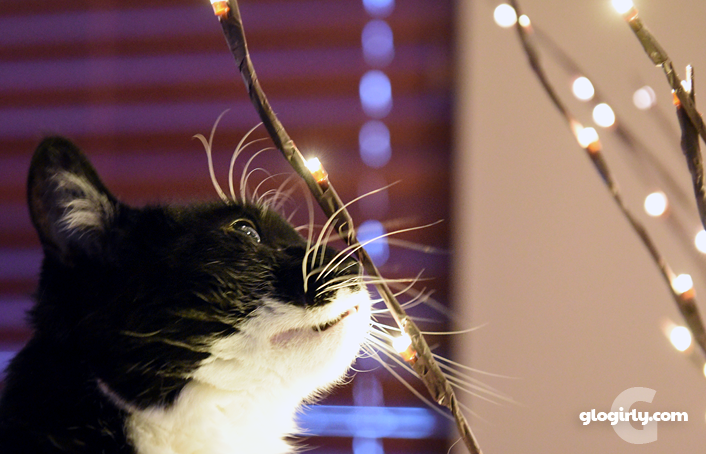 WAFFLES: Yeah, well it's not like you've never played with one of those dangly ornament things. KATIE: I've also never knocked down the whole tree. There's that. WAFFLES: It was crooked. It just needed a little push to the right. Or was that the left? 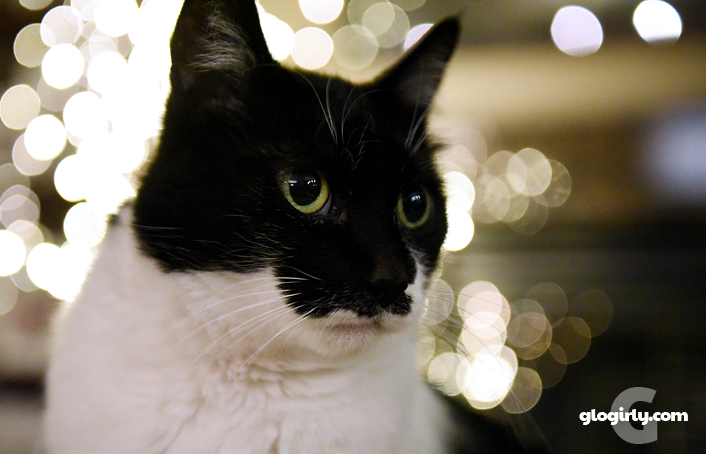 Now that our holiday lights are twinkling here at the Townhouse, we're ready to kickoff the holiday season with our shelter cat friends at Best Friends Animal Society. In the spirit of giving, we're very excited to share a special event with you. Tomorrow is the official digital kickoff day for the annual Best Friends Animal Shelter's $2 Million Holiday Match Event. 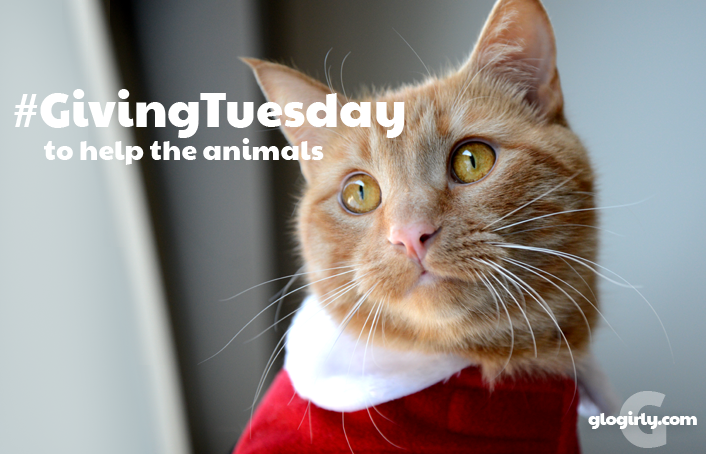 It's inspired by Giving Tuesday, a global day dedicated to giving back. Giving Tuesday was created by the 92nd Street Y and United Nations Fund in 2012 with the goal of starting a movement about charitable giving at the beginning of the holiday season. Thanks to an incredibly generous group of donors, all holiday Best Friends gift donations will be matched up to a total of $2 million dollars. 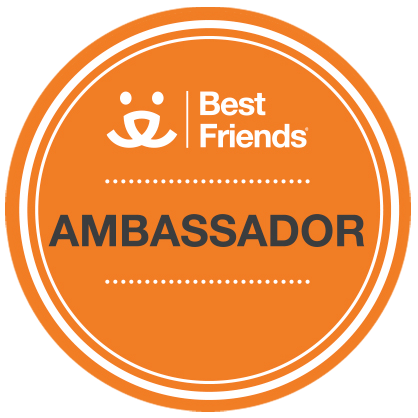 Starting at 10:30 am EST on Tuesday, December 1, Best Friends will be posting hourly videos on their social media channels, including Facebook, Twitter (@bestfriends) and Instagram (@bestfriendsanimalsociety). The live videos will include co-founder and CEO, Gregory Castle, as well as shots from as well as shots from the Best Friends kitten nursery in Los Angeles. Learn more about the event and how to donate at Best Friends Animal Society Giving Page. "Together We Can Save Them All"
GLOGIRLY.com is honored to be a Best Friends Ambassador. Best Friends is a national rescue organization we have a tremendous amount of respect and love for. Best Friends Animal Society’s No More Homeless Pets Network focuses on building relationships and working with rescue organizations and municipal shelters across the country to end the killing of dogs and cats in our nation’s shelters. Katie he's sticking his tongue out at you! And Whaff, tell yer humans if ain't smart enuf to bungee the dang tree sovs tou can climb it in SAFETY then they don'ts deserve one!. I'm really excited about the Best Friends event! I think it is MORE awesome than a Christmas tree (which we didn't get last year anyway). But the tree was crooked, Katie! 🙀 Thanks fur the info on Best Friends. Best Friends Event is COOL ! Waffles you sound like my Tubby kitty. 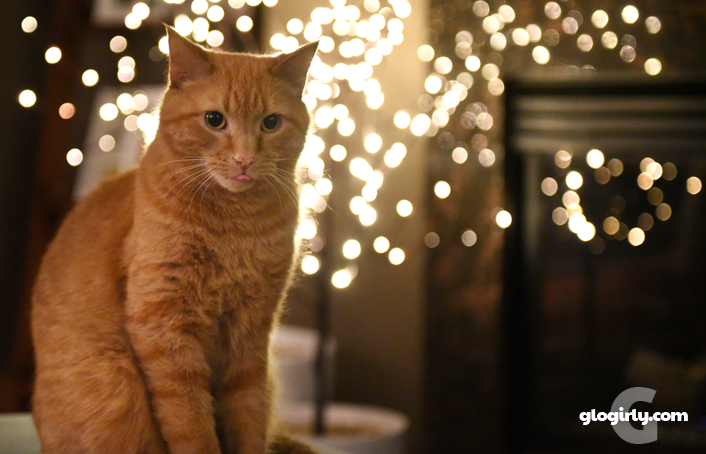 He loves the dangly ornaments too and has been known to climb in the tree. Have a great week. We had to MOL at ornament indiscretions. Our tree has very few breakable things on it. The head peep wasn't going to put one up here, either, but she felt bad that we would not have the chance to sleep under it this year, so she did yesterday. Can you sleep under those stick things? Oops. It's always the orange ones, isn't it? Momma was pretty concerned about putting up our tree with my new sister, but so far Jessie has totally ignored the tree after one investigatory sniff. Good girl! Awww..Glogirly...do you have to go and spoil and little boy's fun?? I think Glogirly's branches are beautiful. I was worried about Mudpie and my tree but so far, so good! At least you have lights on the tree. 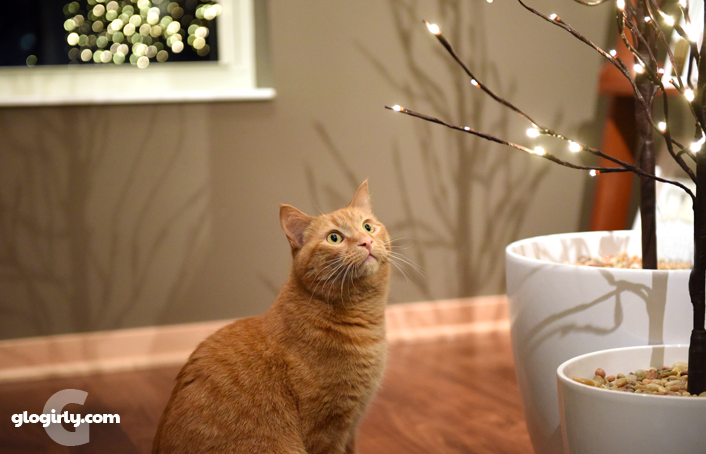 I’ve never played with our trees or ornaments although Autumn knocked the tree down one year. Giving Tuesday is a wonderful idea and I’m glad it was born in NYC. TW once saw Patti Smith do a poetry reading at the 92nd St. Y.
Mum got out a little tree that is all flashy. Derby used to chew on it so it went in the box for years. Well we like your twee. Dat's a pawsum idea. We sure hope all money be raised. Ah, Waffles even when you are being mischievous you are a little cutie. Are you sticking out your tongue to Katie?! Cat got you tongue Katie? I give to Best Friends Society every month. They are awesome! Let's save them all!